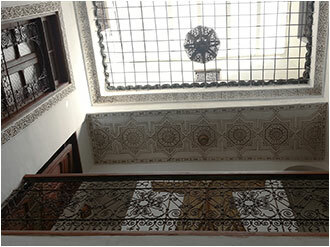 Welcome to Dar Sienna, a beautifully proportioned traditional townhouse in Morocco's Fez medina. Dar Sienna ("dar" means townhouse) has 3 bedrooms, one per floor, each with a private bathroom, overlooking a covered central courtyard salon. 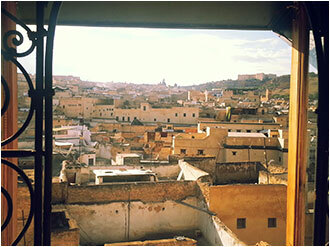 From the rooftop terrace it offers breath-taking 360 degree views over the ancient city of Fez and is an oasis within its bustling, historic medina. When you visit, you will be warmly welcomed with traditional Moroccan hospitality. Our lovely, gentle and caring staff speak English, French, Arabic and a little Spanish and Italian. Whilst the staff are non-resident, they are always at hand and available to assist with anything you may require. The style is authentic Moroccan with a twist: warm colours, sumptuous carpets, Berber wedding blankets and antiques from the souks (markets) of Fez, Meknes and surrounding Berber villages. There is even a gorgeous designer kitchen by Johnny Grey! Dar Sienna is a cosy artist's house. It is run as a homely guesthouse, not a hotel. This is your home-from-home, where you can relax after a busy day, enjoy wonderful Moroccan hospitality and have a genuine cultural experience. Situated in a truly inspirational and exceptional location, Dar Sienna is close to the Kairouane University and Library (the first university in the world), Place Seffarine (Metalworkers Square, which happens to be my favourite place in the medina - apart from the terrace at Dar Sienna! ), The Henna Souk, Souk Attarine (The Perfume Market) and The Sidi Moussa Tannery (but not too close!). All the major sights are close by, not to mention a myriad of workshops, where babouches (Moroccan slippers), saddles for fantasias and jewellery are made, and carpets and cloth woven. And of course there are local cafes and a fabulous market at R'Cif for fresh fruit and vegetables. Dar Sienna is perfect for young at heart guests with an adventurous spirit, interested in Moroccan culture, wishing to experience authentic medina life centred around the fabulous souks and craft workshops. In short, when you visit Dar Sienna, located as it is at the heart of the Fez medina, you will feel as if you are living here, not as a tourist, but as a resident of this beautiful, historic and mesmerising city. 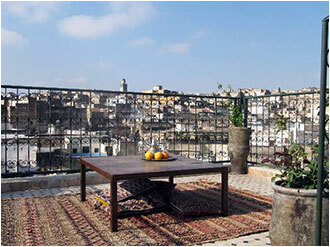 Dar Sienna has 3 private roof terraces. The Tea Terrace, with beautiful wrought iron railings, has a 360 degree, uninterrupted panorama over the rooftops of the medina. This is the spot for enjoying breath-taking views at sunset or experiencing the magical call to prayer. Or just relax and sip mint tea at any time of day. The Breakfast Terrace has a 180 degree view of the medina, including the Henna Souk, the Merinide Tombs, Mont Zalagh (Holy Mountain) and a glimpse of the street life below. Great for early morning yoga or a meditation session. The Dinner Patio is sheltered and secluded, perfect for a romantic diner-a-deux. Breakfast is served on the terraces each day, weather permitting, or in the courtyard salon. So, when can you visit? There is much to see, and a unique experience awaiting you!